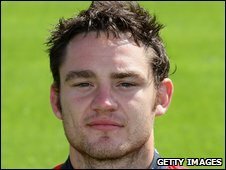 Gloucester rugby union player Ryan Lamb has been arrested by police following a fight in Cheltenham. The incident happened at approximately 0300 GMT on Sunday morning outside the Subtone nightclub on the Promenade. A 20-year-old man from Kent received minor facial injuries in the fight. Police confirmed a 22-year-old man from Gloucester was arrested by officers and charged with assault before being released on bail. He will appear before Cheltenham Magistrates on 9 March. A spokesman for Gloucester RFC said the club would not be commenting on the arrest at this stage.